Buttonville Municipal Airport or Toronto/Buttonville Municipal Airport (IATA: YKZ, ICAO: CYKZ) is a medium-sized airport in Buttonville, Ontario, Canada, within Markham, bordering Richmond Hill and 29 km (18 mi) north of downtown Toronto. It is operated by Torontair. Due to its proximity to Toronto's suburbs, there are several strict noise-reduction procedures for aircraft using the airport, which is open and staffed 24 hours a day, 365 days a year. In 2014, Buttonville was Canada's 20th busiest airport by aircraft movements. There is also a weather station located at the airport. The airport is classified as an airport of entry by Nav Canada and is serviced by the Canada Border Services Agency (CBSA) on a call-out basis from the Oshawa Airport during weekdays and the Toronto Island Airport during weekends. CBSA officers at this airport handle general aviation aircraft only, with no more than 15 passengers. Fred F. Gillies was the operator of Buttonville Airport and Gillies Flying Service starting in 1953 until he retired in 1958. Buttonville Airport began to really grow as a grass airstrip in 1953 when Leggat Aviation moved its operations from Barker Field in Toronto. The airstrip became an official airport in 1962. In September 2009, the Sifton family, owners of the airport, announced plans to re-develop the airport from 2009 to 2016 into a mixed use of commercial, retail and residential development. In the meantime the airport will continue to operate and unknown plans for the airport operations to re-locate to another GTA airport or cease operations altogether. On 28 October 2010, a press release announced that a joint real estate venture had purchased the 170-acre property on 7 October, which will be re-developed by Cadillac Fairview. Plans include condominiums, retail shops, and office space. Due to planning delays, in 2018 Cadillac Fairview announced the site will continue to operate as an airport until at least 2023. Buttonville Airport is privately owned, and although profitable for the last 25 years is threatened with closure due to Urban encroachment and soaring land values. GTAA provided a monetary incentive to keep the airport open, but this was stopped in 2009 ( $1.5 million per year). At the time the GTAA blamed a financial crunch cause by a momentary decrease in traffic at Pearson Airport for eliminating the subsidies. Traffic at Pearson has since increased dramatically from 30 million passengers a year in 2009 to 47 million passengers a year in 2017. Transport Canada has not yet made a decision on the Pickering Airport project. There are three non-precision instrument approaches available: a Global Positioning System (GPS) approach to runway 33, a non-directional beacon (NDB) approach to runway 21, and a localizer approach to runway 15. Buttonville Airport is in a Class D control zone. Two way communication must be established prior to aircraft entering the zone. The airport has a control tower using the frequencies 127.10 MHz for Automatic Terminal Information Service (ATIS), 121.80 MHz for ground control, and 124.80 MHz for tower (with an additional frequency of 119.9 MHz used during busy periods). When the tower is open between 0700 and 2300 local. When the tower is closed Buttonville reverts to a Class E control zone, 124.80 MHz therefore becomes a mandatory frequency. The London Flight Information Centre has a Remote Communications Outlet at the airport operating on the frequency 123.15 MHz. Toronto Terminal handles instrument flight rules (IFR) arrivals and departures and Visual Flight Rules (VFR) flight following on 133.40 MHz. Flightline is available on 123.50 MHz. No practice circuits outside of YKZ Control Tower hours of operation. No practice IFR approaches outside YKZ Control Tower hours of operation. No practice Engine Failure on Take Off procedure (E.F.T.O.s) in the YKZ Positive Control Zone. No touch and go circuits by excessively noisy aircraft. It has been agreed with the airport and the City of Markham that no circuit practice will occur between the hours of 1600h (4:00pm) and 2000h (8:00pm) during all long weekend holidays. Closeup of the new Air Traffic Control Tower. Air Traffic Control Tower on Allstate Parkway. On January 17, 2006, Nav Canada announced plans for the construction of a new air traffic control tower at Buttonville Airport. It is located at the south end of airport next to FlightExec offices on Allstate Parkway. The new tower, representing an investment of over $2 million, replaced the existing facility which was built in 1967 and had reached the end of its useful life. Construction began in Fall 2006 and became fully operational on June 26, 2007. The new tower provided expanded operational space, optimal visibility and the latest in air navigation equipment and technology for 10 air traffic controllers and one support staff who provided service to 84,000 aircraft movements per year at Buttonville Airport. It is located on the south side of the airport – the opposite side of the old tower. The new tower was designed and built using a modular design enabling the facility to be relocated in the future. New equipment and technology include the Nav Canada Auxiliary Radar Display System and the company's state-of-the-art voice communications switch. NAV Canada shut down operations of the air traffic control tower on January 3, 2019. TruFinancial Consultants, tailor-made investment strategy, estate and financial planning services. Seneca College aviation campus was once at Buttonville and has since re-located to Peterborough Airport in 2014 after having been in Markham for over 45 years. The remaining tenants will either relocate to other airports near Toronto or cease operations. The airport is accessible to public transit via York Region Transit Route 16 (16th Avenue) which runs along the north side of the airport. It is within walking distance of the York Region Transit Route 24 stop at Woodbine Avenue and 16th Avenue. There are no direct connections with GO Transit. Airport users can park their vehicles for free at the airport parking area on the north side. Parking lots along Renfrew Drive are reserved for airport tenants. Taxis and limousines within the Greater Toronto Area can drop off and pickup passengers. The airport is located next to Highway 404 with connections to nearby 407 and with 401 to the south and 400 to the west. 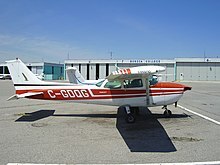 On 25 May 2010, a small Cirrus SR22 4-seater plane crashed on the roof of a building just 500 m (1,600 ft) from the airport in Markham (Woodbine Avenue near Apple Creek Boulevard). The pilot and a passenger died in the crash; however, nobody on the ground was seriously hurt. Markham Fire and Emergency Services crews quickly doused the flames; rescue crews were not able to go on top of the building to reach the plane due to possibility of structural collapse. On 20 June 2010, an accident occurred just off Buttonville Airport. A black four-seater banner-towing Cessna 172K Skyhawk, registration C-GQOR, crashed on Vogell Road near the intersection of Highway 404 and 16th Avenue in Richmond Hill. The pilot, the aircraft's only occupant, was killed in the crash. On 8 October 2010, a Piper PA-28 Cherokee with tail number C-GOYV registered to a Toronto resident made an emergency landing on Highway 407 close to Buttonville Municipal Airport. The pilot was the only person on the plane and no injuries were involved in the incident. On 18 November 2010, a Beech 33 (tail number C-GSCZ) with a Seneca College flight instructor and two students crashed in a field in Pickering, Ontario (near Whitevale Road and North Road). All occupants died in the crash. On 12 July 2018, a pilot was killed in a (Bellanca 8KCAB) when it crashed in a field near the airport (southwest area of airport in Markham). The airport had one aircraft rescue and firefighting unit (ARFF), a Walter RIV 2000, parked against the fence along Renfrew Drive, but it was retired and no longer visible at the airport. Fire and rescue at the airfield is now provided by Markham Fire and Rescue Stations 9-2 (10 Riviera Drive near Woodbine and 14th Avenue) or 9-3 (Woodbine Avenue and Major Mackenzie Drive East). ^ Canadian Aviation. Maclean-Hunter. p. 85. ^ "Company History". Leggatt Aviation. ^ a b "New 'town' to replace Buttonville Airport". Toronto Star. 27 October 2010. Retrieved 2010-10-28. ^ Kelly, Tim (2 May 2018). "Markham Buttonville development on hold; planes will fly for 5 years". York Region News. Retrieved 2 May 2018. ^ Wang, Sheila (2018-11-20). "York Region slams Nav Canada's decision to close Buttonville airport tower". YorkRegion.com. Retrieved 2019-01-05. 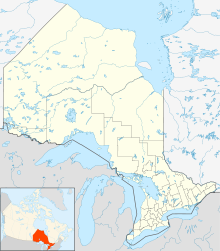 ^ "Seneca Shuffle - Aviation program prepares for move to Peterborough". Archived from the original on 2013-09-25. Retrieved 2015-07-30. ^ "Aviation Investigation Report A10O0240". Transportation Safety Board of Canada. November 18, 2010. Retrieved January 25, 2019. 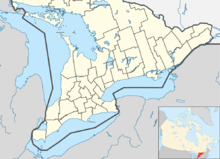 ^ "Pilot killed in plane crash at Buttonville Airport". CityNews. July 13, 2018. Retrieved January 25, 2019. Wikimedia Commons has media related to Buttonville Municipal Airport. Past three hours METARs, SPECI and current TAFs for Toronto/Buttonville Municipal Airport from Nav Canada as available.